For this installations i used found old windows, sounds, scent and projected images. Using these triggers to create an environment for the audience which is contemplative yet unnerving. Dealing with issues of isolation mortality. 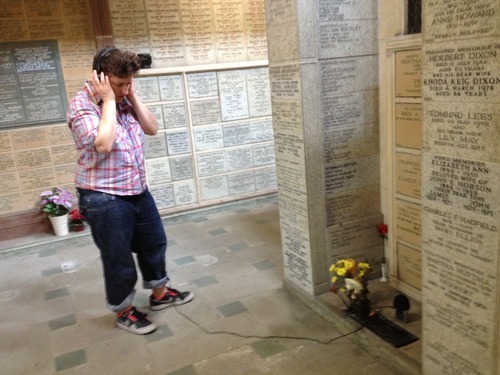 sound recordings at the memorial garden and in memory hall at Manchester crematorium. extract from my MA dissertation on The Memory garden installation. "my final work was to deal with memory and to create an isolated environment, which made people, reflect on their own life and memories and mortality. Within my research I started thinking about the idea of mortality and photography in particularly the death of photography and the death of the image. Through my research I had started to see the space around a photograph as dead space. I had been reading Roland Barthes, Camera Lucida in which he talks about death. There’s a moment in the book when looking at an image of his mother as a young girl he sees this as a sign of his own mortallity. And comes to the conclusion that photography has the essence of death. This got me think about photography and the moving image. If a photograph captures a time and has the essence of death how can you bring that back to life and work with memory? Also at this time at a reading group I was introduced to Michael’s Foucoults essay of other spaces Heterotopias. Again I was drawn to the images of death, to his idea of the heterotopia of the garden and that these can be sacred places, which have juxtaposing space within them. I was also drawn to his ideas about the heterotopia of the cemetery where he talks about the dead body being our only trace of our existence in the world. This made me think about life and our existence. Placing these two ideas together, I started to think about how I looked on life and what makes me think I exist this brings me to my memories. I know I’ve been he amount of time because of the memories I have, just like the photograph I know I’ve been somewhere as I have the evidence of it, I’ve taken a photo I’ve seen the image. Not so much held that image now but seen it on a screen. Its almost like a hard drive becomes a portal of memory, like our mind where our memory’s are stored. This line of thought got me to the idea of the memory garden. A utopia of memory’s a place that exists because memories are kept there but where is this space. I wanted to create this place and in doing so evoke peoples own thoughts on mortally. This got me to the idea for installations based around the idea of the memorial garden but instead of being in memory to people who have passed the memory garden is a memorial to elements passed memories. To create a physical space that was about death but also had a life. With the continuation of my investigation into this piece of work I brought into focus some of the aspects I had learned from. The process of creating this installation showed to me the developments I have made. It shows the concept and themes which I explored and researched whilst planning and organising space and materials. For this installation I used found windows as the main signifier, which made the basis of the installation. It is usual and expected to see a view from a window and that it lets light in but these windows were to be plaed in a darkened space void of all natural light and views. I wanted to use these window frames as resonators of imagery formed by the triggers that were out in place. I wanted to use these window frames as open portals to frame the imagery from people’s interpretation and imagination brought on by the triggers. During the period leading up to the installation I had a studio space outside of university, which meant I could try ideas out in a studio setting for the first time. This was invaluable, as I had not had this space to work in before. I tried out working with the windows and experimented with hanging and different heights and also how the projections and light worked with the glass and frames of the windows. I also went on a field trip to Southern Cemetery and visited the Memory Hall; here the sights and sounds of the place- especially the overwhelming smell of flowers struck me. I knew instinctively that I wanted to capture this smell in my installation. At the cemetery the smell was obviously given off by the flowers left to the dead and discarded of in the bins where they sweated and created a pungent smell. I thought that this would be the ideal work to use smell since being interested in the use of it during my research of other artists. I wanted to signify that flowers were there more than simply have flowers in the installation creating a smell. I also carried out sound recording at the crematorium; I placed the microphone in the flowerbeds to capture the openness of the space. I also placed the microphone in parts of the memory hall to try and capture the echoing of the structure, which suggested a vastness. I used this location to get a true account of a memory garden, which could be used in my memory garden. It is important for to find early on the place I will be installing the exhibition after learning from past mistakes, I knew I had to get into the space and have control of the site. I was allocated a basement room in the sculpture department. I thought this space would do well for the work as it had most of the elements I wanted. It had the cold concrete feel and it was a good size. The room was originally white so I had to paint it black as I wanted to room to be completely light tight. The control of the zone was important because every detail had to be precise. To give an idea about the installation I will talk about the different elements and the decision making process surrounding them. The installation actually starts outside of the entrance with a plaque on the wall and flowers on the floor. The plaque is a text piece but not a description of the garden but a prologue creating a sense of the space within. Flowers lay at the entrance, these flowers were taken from the crematorium from the bins at the southern cemetery- they had been discarded no longer of use. I wanted to use them in the space as, I said before, flowers were a strong presence at the memorial garden and wanted to use them to trigger peoples perception when entering the space for inside the space there are no flowers just the scent of flowers. The first window has many years of built up dust on its surface, which gives a sense of time passing. The window is lit up by a small spotlight, which lights a text piece, which is not obvious at first sight. The text piece in the dust says, “If I look out of the window long enough maybe I will see you”. I feel the text piece and the dust work really well together as a metaphor for time passing yet the stillness of waiting. This window I feel opens the viewer up to questions rather than answers like- how long has this person been waiting? Who do they want to see? Which may trigger similar moments in the viewer’s lives of waiting and longing. The 2nd window is also suspended with a projection coming down from the celling and casting light, which resonates on the window frame before hitting the floor. This almost gives the impression of the view falling out of the window frame. With this moving image there is also audio which has been separated in editing so that it came in intermittently. The image is a pleasant image of two people’s feet dangling and splashing in water. The piece works juxtaposed with the rest of the room as memories aren’t clear but jigsaw pieces fitting together with pieces missing and pieces fitting wrong. The 3rd window has headphones on the floor with sound escaping out, this is the sound of someone running up some stairs and slamming a door and locking it in a sense of panic. This memory for me relates to when I was a child and I used to have a step father who used to beat me, when I had a sense that he was about to hit me I would run up the stairs to the bathroom and lock myself in before he could get to me. I wanted to use this experience and the sound for this installation to create a disturbance within the space, as memories aren’t always pleasant memories. This could evoke tension in the space and therefor the viewer. The headphones I chose to use belonged to my stepfather in the 80’s. In the installation the headphones are used as a physical object, a catalyst of a specific time and space. A forth window was placed in the ceiling with a mirror which reflects the windows below and also reflects the viewer placing the viewer inside the installation. The mirror also creates a sense of infinity and a utopia; this idea was triggered when researching the artist Olafeur Elliason and his artworks such as ‘I grew up in Solitude and Silence’. The last window was an empty window that was placed by the door, viewed mainly on exit. This window was purposely left empty to encourage the viewer to fill. Also in the space is a recording from the memorial garden, which was mainly that of bird song, which I placed in the ceiling. This was to give sense of a bigger space, an outdoor space, also a space that was relaxing and contemplative. This was the fundamental structure and elements of the piece, I will go into more detail about what this meant to my investigation. For the investigation to take shape in the installation I wanted to use triggers that would evoke memory and emotion, these triggers were in the form of sound pieces, moving image, smell and objects. This installation was very much about creating an environment in a controlled space but whilst working in the space it became a lot more than I had previously explored and my investigation moved on. From the small feedback I’ve got so far it is clear to me that in terms of tapping into peoples imagination and the ability to think beyond the structures that were there- that the installation works. The installation will be adapted for the new space in the Holden gallery, where I can make more of the outside area of the installation space, and with the triggers of the plaque and flowers placed at the entrance. Also for the assessment I had purposely made the sound pieces shorter during editing to make the coming in and out times for the sound right for the amount of time assessors were restricted to being in the installation. I will be extending the timing of the sound for the Holden Gallery and also making it a more fuller and louder sound. This will work better in the av room I’ve been allocated in the as it is a larger space and is not as contained as the basement. As people will be viewing the work differently as apposed to assessing it, people will be able to take longer over viewing and also be able to return to the installation. I would still like it to be a one person at a time experience. I think it’s important to the work so the viewer can fully immerse themselves in the envioment and give them time and space to imagine. With this investigation the work has taken on new forms and ideas, and at times i felt like i was working inside of a camera, as i was working within the elements of light, mirrors and reflections i was becoming the mechanics of the camera creating the images, Also working with the subject matter of memory I thought again about where these memory’s are actually stored in our mind, I thought about the fragments of memory’s and how the simplest of things can trigger memory even memories we thought we had lost. How something can bring these memories back from behind dusty windows. This was what I tired to recreate and this opened up a whole new thought process for me to do with dementia and how people’s memory becomes edited, how people can remember memories from their youth but forget things that have just happened. How our lives are a series of memory’s and what happens when we don’t have the capability of memory how do we know who we are? What we have done? Where we have been in life? If you’re still alive with no form of memory, as with Roland Barthes view on death with these memories captured like a photograph, but now gone do you die many a death? and where are these memory’s have they fallen out of the mind like the projection in the installation looking like its fallen out of the window. Or are they stored somewhere gathering dust locked away in a memory garden."